In the Celtic tradition, kings and important people were buried standing up, their feet pointing towards the east. The Celts believed this burial position enabled the spirit of a hero to continue to roam the earth and protect the clan. If the head pointed down when buried, the magic power would vanish. 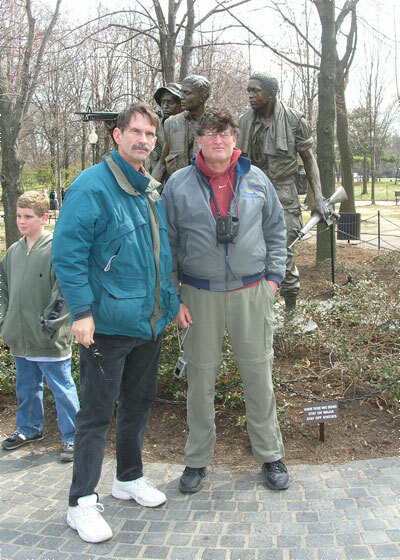 On a cold spring Saturday, I met up with friends John Lyons and Doug Hoyt, here in town to visit the Vietnam Veterans Memorial. It sits protected, tucked in a hillside along Constitution Avenue, unviewable from that busy street. 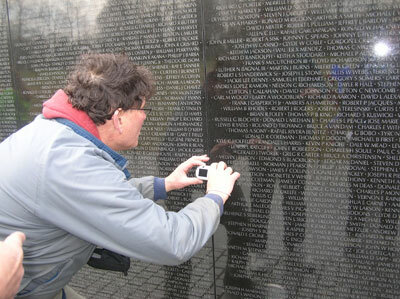 One must physically make the effort to see the black granite sculpture, designed by architect Maya Ying Lin. 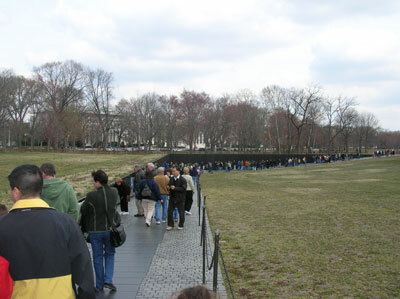 The total length of The Wall is 493 feet 6 inches. 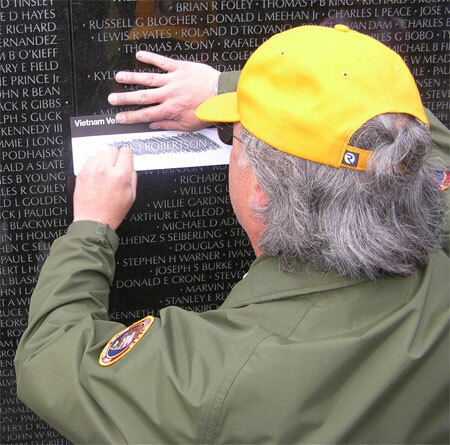 And there are over 58,000 names engraved upon it, each 1/2 inch in height. 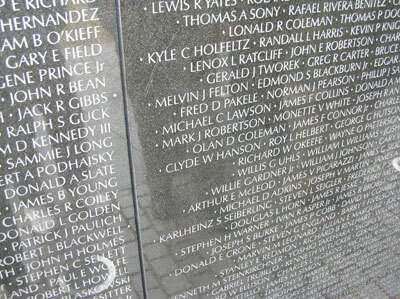 Four granite panels on each end remain empty. The poet Robert Frost wrote, "the best way out is always through," and sometimes it is a long black path of memory. 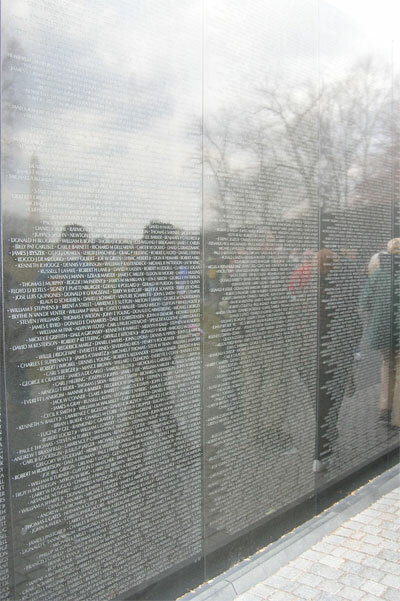 Jan Scruggs, the man who started the movement for the Memorial, stated, "I think it will make people feel the price of war...it will make them understand that the price has to be paid in human lives." Doug had never been to The Wall. 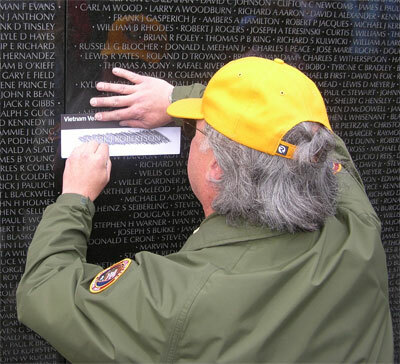 He was an Army Warrant Officer and helicopter pilot in Vietnam from 1969 to 1971. Shortly before Doug finished his tour of duty, a fellow Warrant Officer named Mark J. Robertson and crew switched "sorties" with Doug and his crew. Mark and his men were shot down and the whole crew lost. Doug told us that he found out when a fellow in the squad room came running through the hooches announcing that Doug Hoyt had perished that day. Apparently, the duty roster was not updated when the schedule switch was made. Doug found Mark Robertson again on Saturday, thanks to the Memorial Directory. 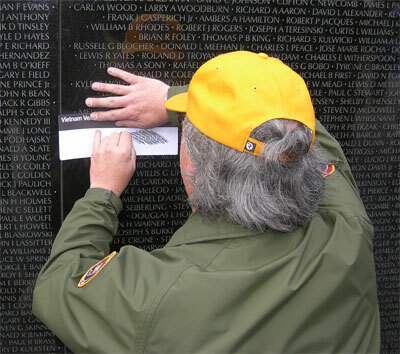 And a park ranger in a yellow hat, also a veteran, bought Mark Robertson's spirit back, with a piece of paper and a rubbing stick. Healing appeared before us in 14 letters. A woman behind us wept openly. And when the rubbing was completed, the ranger handed the paper to Doug, shook his hand strongly, and simply said, "Welcome home." Afterwards, the three of us walked around through the park to sit on cold marble stairs at a place a few feet from where Martin Luther King told us about the spirit of a dream he had for his children. 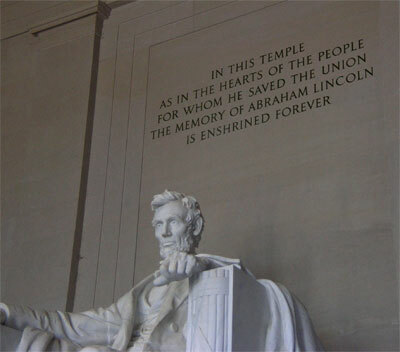 Not far away from the statue of a man who sits in a chair, his head up, looking east. What more can be said then what you said. That was beautiful. Mark J. Robertson is my wife's first cousin. 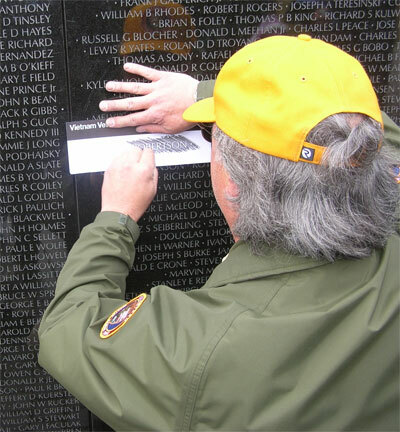 The traveling Vietnam Wall was recently in our home town in Michigan. When we first heard it was coming we both knew that we wanted to go and see it and find Mark's name. When we got there we went into the information tent and were asked what name we were looking for. After mentioning his name, a volunteer named Lisa pulled out a information sheet with Mark's picture and what information she had and asked my wife, " Is this your cousin? " To my wife's surprise it was him. The volunteer was so excited and had informed us that they had a march for Mark over the Memorial Day weekend two weeks prior. This has brought much excitement to Mark's family and has sparked a renewed interest in finding out more about what happened to him and we came across this blog. What a mind blower. Doug, you and Mark will forever be linked together by fate and Gods will. God chose to spare your life and bring Mark home that day. Mark is survived by his father, two brothers, and three sisters. We would like to thank all who have become a part of keeping Mark's memory alive as well as the many other soldiers and their families who have paid the ultimate price for our freedom. Thank you and May God Bless America.